Compressed air energy storage is not exactly a new technology, but it has yet to be widely deployed because no one quite knows how it would work at a large scale. City-wide compressed air energy systems have been built since 1870. Cities such as Paris, Birmingham, England, Rixdorf, Offenbach, Dresden in Germany and Buenos Aires, Argentina installed such systems. As of 1896, the Paris system had 2.2 MW of generation distributed at 550 kPa in 50 km of air pipes for motors in light and heavy industry. Usage was measured by meters. The systems were the main source of house-delivered energy in these days and also powered the machines of dentists, seamstresses, printing facilities and bakeries. The first utility-scale compressed air energy storage project was the 290 megawatt Huntorf plant in Germany (1978). The second Alabama Electric Cooperative's 110 megawatt McIntosh plant has been running for 20+ years. This unit can start up and be on line within 14 minutes. Both of these projects use salt domes for air caverns. Advanced, second generation Compressed Air Energy Storage (CAES) plants have the capability to augment renewable generators, meet the on-peak needs of utilities, and mitigate the power fluctuation and energy management (ramping and regulation) issues associated with wind and other renewable resources. CAES plants use off-peak electricity to compress air into an air storage system. When the grid needs additional electric power, air is withdrawn from the store, heated with a small amount of natural gas, and passed through an expansion turbine to generate electricity. The compressed air may be stored in several types of underground media, which include porous rock formations, depleted gas/oil fields, and caverns in salt or rock formations; or, the air may be stored in above ground vessels or air pipelines. Some additional energy (typically natural gas) is used during the expansion process to ensure that maximum energy is obtained from the compressed air. By some estimates, 1 kilowatt-hour worth of natural gas will be needed for every 3 kWh generated from a CAES system. Because wind and solar vary in a daily pattern, storage technologies need to be in the 100 - 300 MW range. CAES can make money through energy price variation -- playing the spread between on-peak and off-peak prices. The differential between the two prices is the time-value of energy storage. This is basically, "Buy low, sell high." Adiabatic Storage - The heat that appears during compression is also stored, and then returned to the air when the air is expanded. This is a subject of ongoing study, but no utility scale plants of this type have been built. The theoretical efficiency of adiabatic energy storage approaches 100% for large and/or rapidly cycled devices, but in practice round trip efficiency is expected to be 70%. Heat can be stored in a solid such as concrete or stone, or more likely in a fluid such as hot oil (up to 300C) or a molten-salt (600C). Diabatic Storage - The extra heat is removed from the air with inter coolers following compression (thus approaching isothermal compression), and is dissipated into the atmosphere as waste. Upon removal from storage, the air must be re-heated prior to expansion in the turbine to power a generator. The heat discarded in the intercoolers degrades efficiency, but the system is simpler than the adiabatic one, and thus far is the only system which has been implemented commercially. The McIntosh CAES plant requires 0.69kWh of electricity and 1.17kWh of gas for each 1.0kWh of electrical output (a non-CAES natural gas plant can be up to 60% efficient therefore uses 1.67kWh of gas per kWh generated). Dispatchable Generation - Sources of electricity that can be dispatched at the request of power grid operators; that is, it can be turned on or off upon demand. This should be contrasted with certain types of base load generation capacity, such as nuclear power, which may have limited capability to maneuver or adjust their power output. CAES can help make intermittent power sources such as wind power dispatchable. The time periods in which dispatchable generation plant may be turned on or off may vary, and be considered in time frames of minutes or hours. Intercooler (original UK term, sometimes aftercooler in US practice), or charge air cooler, is an air-to-air or air-to-liquid heat exchange device which removes the heat of compression (i.e., the temperature rise) that occurs in any gas when its pressure is raised or its unit mass per unit volume (density) is increased. Compressing air heats it and expanding it cools it. Therefore practical air engines require heat exchangers in order to avoid excessively high or low temperatures and even so don't reach ideal constant temperature conditions. Isothermal Compression and Expansion approaches (which attempt to maintain operating temperature by constant heat exchange to the environment) are only practical for rather low power levels, unless very effective heat exchangers can be incorporated. The theoretical efficiency of isothermal energy storage approaches 100%for small and/or slowly cycled devices and/or perfect heat transfer to the environment. Turbo-expander, (Also referred to as an expansion turbine), is a centrifugal or axial flow turbine through which a high pressure gas is expanded to produce work that is often used to drive a compressor. Because work is extracted from the expanding high pressure gas, the expansion is an isentropic process (i.e., a constant entropy process) and the low pressure exhaust gas from the turbine is at a very low temperature, sometimes as low as −90 °C or less. Efficiency - CAES plants consume about 35% of the amount of premium fuel utilized by a conventional combustion turbine (CT) and thus produce about 35% of the pollutants per kWh generated from a CT. Availability - CAES is the only technology available today, other than Pumped Hydro which can store large amounts of energy and release them over long periods of time. According to a recent study by EPRI, 80% of U.S land has geology suitable for underground storage. Pumped hydro is still the most common option for large scale energy storage, but few new sites are available and they are linked to weather. Potential Large Scale - Like pumped hydro, there are no technical limits to the implementation of large projects. Energy price variation -- playing the spread between on-peak and off-peak prices. The differential between the two prices is the time-value of energy storage. This is basically, "Buy low, sell high." But according to Smith at B&V, this doesn't necessarily get you there. And "there" is the ability for a CAES project to generate revenue as a stand-alone project. 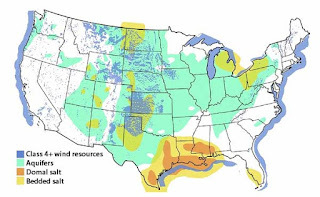 Limited Geologic Formations - Unfortunately, the geologic formations necessary for compressed air storage are relatively rare, meaning that it likely will never be a major contributor to the national energy system. At large scale open to similar siting constraints as Pumped Hydro. Proof of Concept - The eﬀectiveness and economy of CAES has not yet been fully proved, especially Adiabatic Storage. Re-Heat Requirement - Upon removal from storage, the air must be re-heated prior to expansion in the turbine to power a generator. The technology is not truly “clean” because it consumes about 35% of the amount of premium fuel consumed by a conventional combustion turbine and thus produces about 35% of the pollutants on a per kWh basis when compared to it. The first adiabatic CAES project, a 200 megawatt facility called ADELE, is planned for construction in Germany in 2013. ARRA Demonstration Project Funding has been announced. The focus is to demonstrate the CAES technology with an optimized energy ratio and heat rate at both full load and part load conditions. The overall goal is to have an energy ratio of 0.80 kWh-In per kWh-Out and a heat rate of 4000 Btu-In per kWh-Out. Both above ground and below ground CAES projects will be considered for demonstration under this announcement. For above ground systems, projects in the range of 10 MW to 50 MW and 2 to 5 hours of storage, or better, are desired. For below ground systems, all projects meeting the scheduling requirements of the electric service utility will be considered. Include the electric transmission and/or distribution operating entity as a team member. Ramping power rate; the plant's generation cycle shall be greater than 30% per minute of the plants maximum power generation capability. Power density; to provide a MW footprint per acre that is at least 50% better than that of a combustion turbine for the same MW capacity level. ADELE -The first adiabatic CAES project; the heat that appears during compression is also stored, and then returned to the air when the air is expanded. Construction will begin in 2013 in Staßfurt, a city in Sachsen-Anhalt, Germany (ADELE stands for the German acronym for adiabatic compressed air energy storage for electricity supply). The project is a joint effort between RWE, General Electric, Zueblin, and the German Aerospace Center. The German Federal Ministry of Economics is also providing state funding. Altogether, the project members will contribute an amount of EUR 10 million. . The demo plant will generate electrical power of up to 200 megawatt for five hours giving it a storage capacity of 1,000 (MWh). 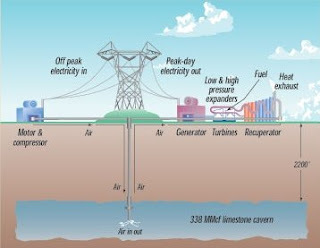 With CAES, air is compressed during periods when electricity supply exceeds the demand; the resulting heat will be buffered in a thermal energy storage, and air will be pressed into underground caverns. When electricity demand increases later on, this compressed air can then be used to generate power in a turbine. During the compression process, the temperature of the air will play a decisive role since it rises to more than 600°C – thus making high demands on the compressor technology. GE is producing a preliminary aerodynamic design and the preliminary mechanical compressor design. To ensure that the resulting heat will not be lost, it will be extracted from the compressed air, before the air is stored, and absorbed by thermal energy storage. The heat storage facilities are up to 40m high containers with beds of stones or ceramic bricks through which the hot air flows. As soon as power is to be generated and before the air will be able to drive a turbine, the cold, compressed air must be heated again by the thermal energy storage. This adiabatic approach whereby the heat of the compressed air is not lost but remains in the process and can be used for power generation differs from existing compressed-air reservoirs primarily by its significantly higher levels of efficiency. Furthermore, the compressed air will not be heated by means of natural gas – thus avoiding CO2 emissions. Dresser-Rand (NYSE: DRC) – Houston, TX - Builds above ground compressed air systems. Designed and built the entire turbomachinery train for Alabama Electric Cooperative’s McIntosh facility – the first CAES plant in the U.S. It has an impressive track record of availability and starting reliability since 1991, and continues to satisfy the intermediate and peaking electrical production needs of this major utility. Energy Storage and Power LLC, Bridewater, NJ - A startup that intends to license compressed-air energy-storage technology patented by Michael Nakhamkin, who led the design and deployment of the technology at the only CAES plant in the United States, located in McIntosh, Ala. The joint venture, Energy Storage and Power LLC, intends to license compressed-air energy-storage technology patented by Michael Nakhamkin, who led the design and deployment of the technology at the only CAES plant in the United States, located in McIntosh, Ala. Energy Storage and Power's primary focus will be licensing Nakhamkin's design, although it could build its own plants as well. The design could build CAES plants with a capacity of 15 megawatts to 450 megawatts. PSEG Global, a subsidiary of PSEG Energy Holdings and an affiliate of PSEG Inc. (NYSE: PEG). is investing $20 million over the next three years to run the startup. PSEG Inc. also owns New Jersey electric and gas utility PSE&G. FirstEnergy, (NYSE: FE) Akron, OH based utility purchased the rights to develop a compressed-air electric storage and generating plant on a 92-acre site in Norton, Ohio, from CAES Development Company LLC in November 2009. The transaction includes rights to a 600-acre underground cavern, formerly operated as a limestone mine. The company is evaluating its options related to the project, but has not yet committed to development scope or timing. However, an initial phase could involve installing two to four units capable of generating a minimum of 268 megawatts (MW) of electricity. With 9.6 million cubic meters of storage, the Norton Energy Storage Project has the potential to be expanded to up to 2,700 MW of capacity. Hydrostor - Toronto - Their first-of-its-kind system mechanically converts electricity from the grid to compressed air, which is captured, cooled and can be stored indefinitely in underwater accumulators. These accumulators are large, high-strength polyester bags that inflate with the air like a big balloon – no doubt producing quite an underwater show for salmon and lake inhabitants. When the grid needs the stored energy, the weight of the water pushes the air back to the surface where Hydrostor's expander/generator system sends it back. Hydrostor ran a pilot of its underwater compressed air energy storage (CAES) technology in summer 2011 and with partner Toronto Hydro will construct a 1MW, 4MWh demonstration facility about 7 kilometers from Toronto's shore later in 2012. ISEP - Iowa Stored Energy Park - Des Moines, IA - a 270 megawatt project which would have used aquifer-based air storage. The team started with more than 100 potential sites across the state. They used existing geologic surveys to lower it down to just five. They ran seismic tests on those sites, and then took drilling samples last year at the most promising one, just outside of Dallas Center, a Des Moines suburb. Compressed air would have been stored 3,000 feet below ground in an upside-down-bowl-shaped aquifer made of porous sandstone. Ultimately, the group concluded that air didn’t flow fast enough through the aquifer for it to be effective as a compressed-air energy storage site. LightSale Energy - Berkeley, CA - The business now consists of two main elements: an energy-storage component, for which the product is still in development; and high-pressure-storage tanks for natural gas and industrial gases, which it plans to sell primarily to logistics companies that distribute and recover natural gas and to compressed-natural-gas refueling stations. LightSail expects to ship its first such tanks in the next few months. LightSail has raised more than $70 million from the venture arm of French Energy giant Total, Peter Thiel, Bill Gates, Khosla Ventures, and Innovacorp, in pursuit of a CAES system that doesn’t rely on underground caverns as a storage medium. LightSail says its use of spun carbon-fiber tanks has allowed it to solve the cost problems faced by SustainX, which was using traditional steel tanks. LightSail also claims that it has come up with a way to capture and store both the mechanical energy and the thermal energy used in compressing air by injecting a cool water mist into the compression chamber as the air is compressed, reducing the heat that is generated during this step. When the captured pressurized air is released back through the system, the heated water is re-infused into it, allowing that heated air to return more energy. Magnum Energy Storage LLC - Salt Lake City, UT - A gas storage company that is developing a 2,050-acre site in the desert north of Delta, Utah. The plan is to use solution mining to build four caverns in a massive salt deposit about a mile underground. The caverns will have capacities of about 10 million barrels of natural gas or an equivalent. The complex, part of the Western Energy Hub Project, will at first store natural gas. But the company plans to make it available for CAES in the future. PG&E, San Francisco, CA - Building a 300 MW Underground CAES. The demonstration project will validate the design, performance, and reliability of an advanced, underground 300 MW Compressed Air Energy Storage (CAES) plant using a saline porous rock formtion located near Bakersfield, CA as the storage reservoir. In January 2010 , the CPUC allowed PG&E to match the DOE award and commit up to $24.9 million to Phase 1 of a three phase Smart Grid Compressed Air Energy Storage demonstration project, which includes all permitting, transmission interconnection, and plant design leading up to construction. The completed Compressed Air Energy Storage project will have a generation capacity of 300 megawatts for up to 10 hours. August 2, 2013. The California Energy Commission (CEC) showed support for the project with conditional approval of a $1 million grant. Information obtained during Phase 1 will be used to determine whether PG&E should proceed to subsequent phases. SustainX - West Lebanon, NH - SustainX was founded in 2007 with the goal of removing these constraints by storing air in industrial pressure vessels, and using isothermal cycling -- keeping the compressed air at a constant temperature -- coupled with staged hydraulic compression and expansion to improve the efficiency of the process. SustainX raised about $30 million from investors including Polaris Venture Partners, General Catalyst Partners, RockPort Capital Partners, Cadent Energy Partners, and GE Energy Financial Services, as well as $5.4 million from the Department of Energy to build its prototype facility. But it hasn’t announced any projects since that one, and was rumored to have laid off a large number of staff in 2014. SustainX says its competitive advantage is in how it uses a water spray to keep the air at a constant temperature through the compression and storing process. In January 2011, the company announced a patent for that technology, and says it holds three patents around its technology. In 2015, SustainX announced plans to merge its business with that of General Compression, a startup that’s focusing on bringing new technology to the traditional CAES model. The companies announced a “letter of intent to combine their businesses, subject to certain conditions, into a new entity to be called GCX Energy Storage,” and will focus on “combining fuel-free CAES technology with low-cost existing and developable salt caverns” in their future endeavors. Both companies had existing CAES projects up and running, but General Compression’s 2-megawatt, 300 megawatt-hour project in Gaines, Texas is much larger than SustainX’s 1.5-megawatt, 1 megawatt-hour project at its Seabrook, N.H. headquarters -- and bigness is where CAES really shines in comparison to batteries or other smaller-scale energy storage alternatives. The final FOAs are available at http://www.fedconnect.net/ Search public opportunities for the following reference numbers: Smart Grid Investment Program (DE-FOA-0000058) and Smart Grid Demonstrations (DE-FOA-0000036). That's why it is necessary to always check around first before you get any service to make sure you get the best quality of service for your dollars. The reason why there aren't more CAES plants around is not because "no one knows how they'd work on a large scale." Pumped storage, the OTHER bulk energy storage technology, has been around for decades and utilities know very well how it works on a large scale. And to get technology-specific, there have been two full-scale CAES projects operating for 32 and 22 years, respectively, at 290 and 110 MW, respectively, at high reliability levels. Both use salt-based storage--a well-known element thanks to the frequent use of salt caverns for gas storage. And the technology is available "off-the-shelf" but with some customizable features depending on performance goals. Also, the newer technologies for CAES represent a potential incremental gain, but do not represent a significant gain in round-trip electrical efficiency. The statement that CAES is not truly "clean" is very misleading; CAES, using today's technology, is clean by any standard of conventional generation, consuming half the fuel of a super-efficient combined-cycle gas plant. When paired with renewable energy, it becomes even more of a "clean" product. Finally, the main reason that there are not more CAES plants in operation is partly related to geological limitation and partly the same reason that no one's built pumped storage in the U.S. since 1993: the market for bulk storage was in a lull between the nuclear age and the renewable energy age. Today, however, that situation is changing quickly, and there will be both new CAES and pumped storage plants built in the U.S. within the decade. The theoretical efficiency of isothermal energy storage approaches 100%for small and/or slowly cycled devices and/or perfect heat transfer to the environment. I am an Energy Systems Engineering graduate student, doing research on Energy Storage in Energy Hubs and have found you from DOE Global Energy Storage Database. I wonder if you could give me some data about business case multi-megawatt energy storage system, Adele CAES Project, flywheel and … , including power range (MW), energy range (MWh), charging and discharging (%), standby loss (% or W per hr),life (yr), capital and annualized cost($, $/MW).